I must confess that I’m still in vacation mode so knitting sometimes is easier than reading. Well, as you can see my knitting is also in vacation mode. I made a couple mistakes in my cable pattern. I refused to rip it out though so it’s a done deal. Actually, I had a bit of an issue with the cable chart. 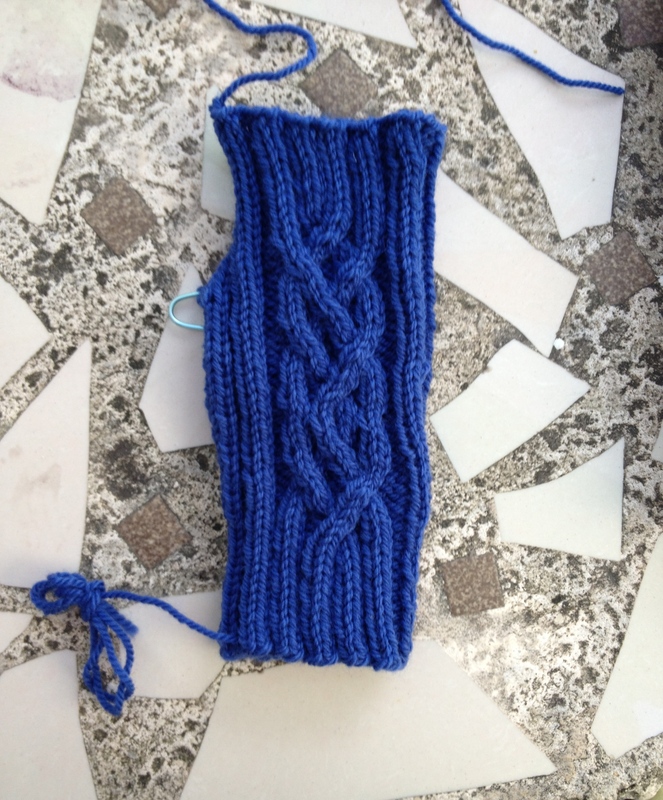 The whole pattern is made up of even number of stitches for the k2, p2 ribbing. How can there be a cable chart over 17 stitches that will come out like the picture. I sort of fudged it to make it work. Spoken like an adventurous knitter! Next step is to create the second mitt and redeem myself. Oh and by the way, the gauge issue didn’t seem like much of a problem. The mitt seems to fit just fine! Another week has gone by and I’m happy to report that I’m up to page 177 out of 252. Progress is being made on the reading and observing part. Actually it’s a bit of a cheat as I only really covered 3-ply and 4-ply yarns sections (lots of projects to pursue in these sections). I now know that 3-ply yarns are perfectly balanced – amazing – who knew? On to the project-making part that has been weighing heavily on my mind. Not really so heavily, but it sounds good. I feel like I’m going one step forward and two steps backwards. Mistake 1: I purchased a lovely variegated yarn for the project and then realized that the mitts have a cable pattern. How will it ever show up with this yarn? Back to Michael’s for a pretty solid blue wool. By the way, this yarn has 3-plies. Mistake 2: I actually purchased a set of double-pointed needles in size 7 (4.5mm) when I probably have at least 3 sets (since my last purge of needles and hooks). So I get home with my solid yarn and dutifully swatch a good-sized swatch. No good – gauge 18 sts and 24 rows over 4″. 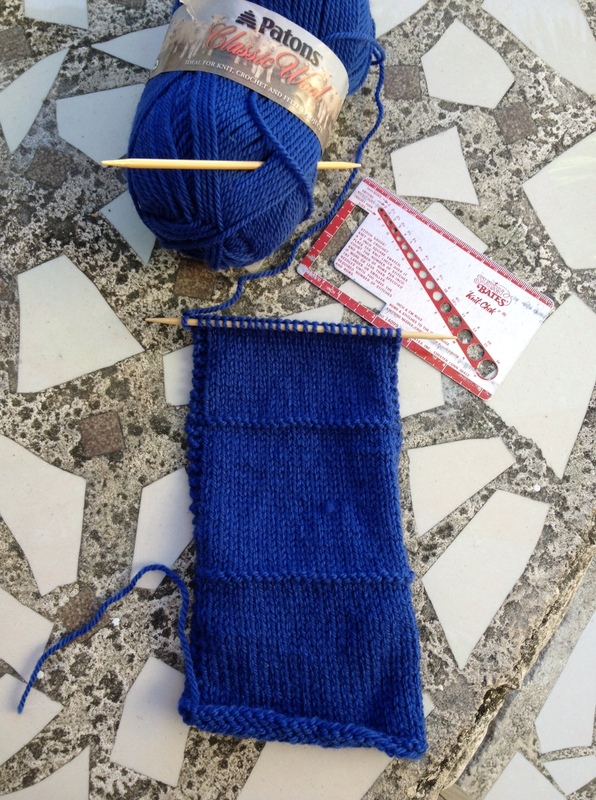 Mistake 3: I tried a swatch with straight size 6 (4mm) needles (before I buy another set of dons). Well this gauge is 19 sts and 26 rows over 4″. Ugh! Not good. I can’t go much lower in needle size with this yarn. Brilliant idea! 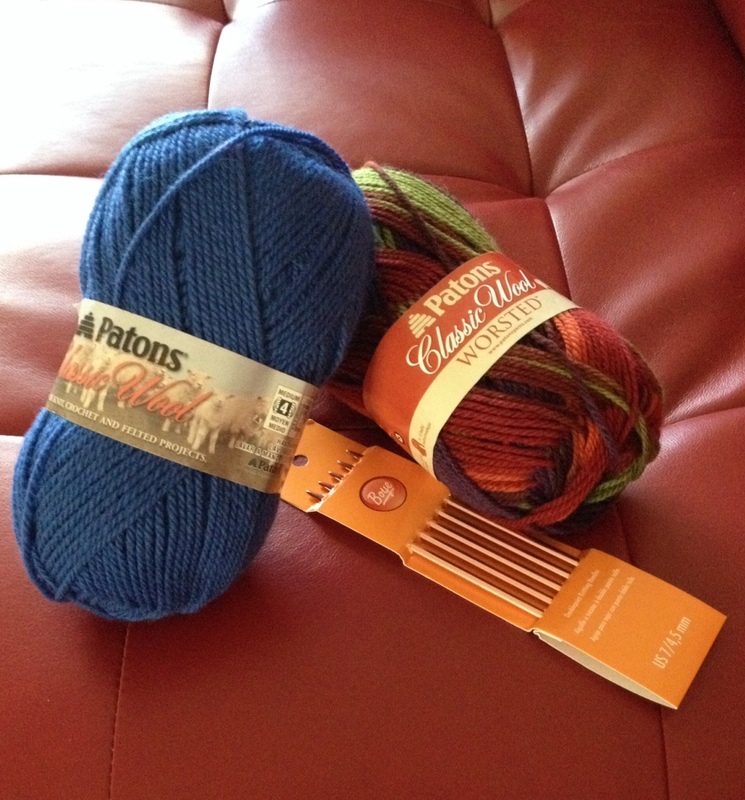 I exchanged the size 7 (4.5mm) double-pointed needles at Michael’s. Forget that I had made a swatch with 2 of the needles (hardly used) for a set of bamboo double-pointed size 6 (4mm) needles. The result: 20 sts and 26 rows over 4″. I give up! I’ve knit more swatting than one whole finished mitt. I’m going to knit the mitts with the bamboo needles and hope for the best. 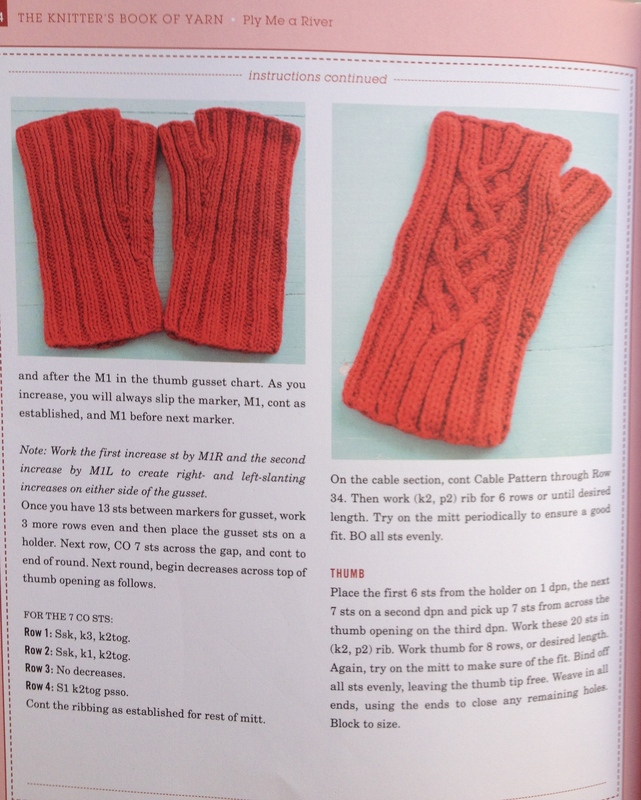 I know this is technically wrong – knitting gods, please forgive me! This week I feel like I’m sitting in the cat-bird seat being away from the snow that the whole Northeast is experiencing. In Florida all we got was some fairly warm rain. But I digress. This week I’m reading “Ply me a River”. Very puny! I’ve gotten through single and two-ply yarns that come along with a number of projects for each type. I’ve decided that one thing I really like about this book is the way the patterns are laid out. As a former knitting editor, I take this very seriously. Easy to find all the info you need about size, yarn, needles, notions and gauge. Clara gives a nice personal note at the beginning to tell you a little more about the yarn, designer or the project. Really nice touch. This week I also decided on yarn for my Project #8 Princess Mitts. Not having a ball of worsted yarn suitable for the project in Florida (OMG – so much yarn at home! ), I ventured to Michael’s. Yes, no local yarn shop, but I did Clara Parkes proud buying on ball of 100% variegated wool. I could do no less in my journey through her book! 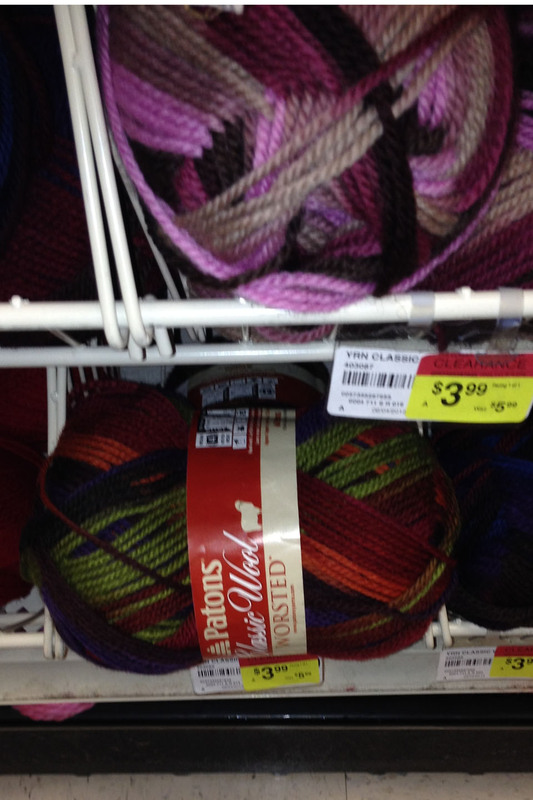 The yarn was on sale – so even better!